← Do Elite Academic Institutions Make Fewer Football Mistakes? Right before I left San Diego for Rochester, I wrote a post in one of the Los Angeles Angels’ fan message boards. On the surface, it explains how to catch baseballs at baseball games. In practice, it was a recap of the first 22 years of my life. It apparently struck a chord and popped up on the site’s front page later that night. I run into it every year or so, and I end up drawing the same conclusion every time: even though it predates all the Game Theory 101 stuff by more than a year, it is the best thing I have ever written and probably the best thing I will ever write. As such, I am preserving it here so I will never lose it. I have been an Angels fan since the tragedy known as the 1995 season. I grew up in the northern part of Los Angels (sic) County, so I don’t have a very good reason why I wear red instead of blue. It just is what it is. The downside was that I virtually never went to Angels games as a kid due to the fact that my parents did not like sports and we lived a pretty long distance away. But the rare times I did went, I always dreamed of catching a ball—a foul ball, batting practice ball, home run ball, a ball flipped up to the stands by a groundskeeper, any ball. Of course, we always had cheap seats too far away to get anything during a game. And a batting practice ball? That would have required getting to the game early—and the bottom of the first inning does not qualify. So I went through childhood with zero, zilch, nada. Undeterred, I went to college. Armed with my own car and my own money, I could go to a lot of games as early as I wanted to. Now I was bigger, faster, and stronger. And, dammit, I wanted a ball. Junior year rolled by, and my then girlfriend bought us tickets to a game. I took her to batting practice. Maybe my luck would change. Maybe I could get a ball. Maybe I could impress her. And with one flip from a groundskeeper by the bullpen, it did. Unfortunately, one isn’t satisfying. I thought it would be, but it’s definitely not. You get a rush from getting your first, and you immediately want to get another. So I kept going to batting practice in search of a second high. In college, I studied political science. I was introduced to a tool known as game theory midway through my junior year. Rather than trying to craft a more clever argument than the next guy, you can use game theory to construct models of the political interactions you are trying to describe. The neat part is that, once you have solved the game, your conclusions are mathematically true. If your assumptions are true, then the results must follow as a consequence. The other cool part is that game theory is applicable to more than just political science. Life is a game. Game theory is just trying to solve it. The trick is figuring out how to properly model situations and what assumptions to make. Take care of those things, and you can find an answer to whatever question you want. Baseball is a game, but so is hunting down baseballs as a fan. We all want to get them. The question is how to optimally grab one when everyone else is trying to do the same thing. Fast forward to Opening Day of my senior year. I was standing there, hoping like hell a ball would find its way into my glove. If I stayed there long enough, I am sure one would have eventually gone right to me. But batting practice is short, and I would hate to only get one ball every 100 games I go to. Then I noticed something a little revealing. It seemed like there would always be a couple people who would get three or four balls every time I went to the ballpark. I would always hear people say “lucky” with a hint of disdain the second, third, and fourth times they caught a baseball. But let’s be honest—it would take a tremendous amount of luck to get four baseballs in a single game if unless you were doing something everyone else wasn’t. You are lucky just to get one. But four? Skill. Since then, I have never left a session of batting practice with fewer than three balls. Why am I telling you this? After all, the more people who know the secret, the harder it will be for me to catch a ball. 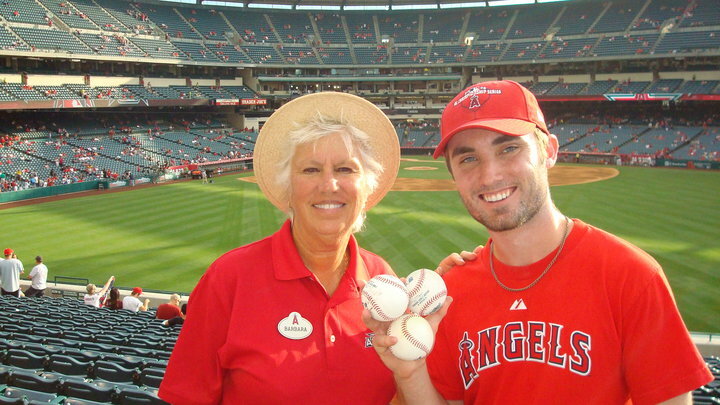 That’s Barbara, my favorite usher in Angels Stadium. I can’t count how many times I have heard her tell parents to stop dangling their five year olds over the railing trying to siphon a ball off a fielder. (It baffles me why parents take such a risk in the first place. I’m pretty sure it is because the parents want the ball for themselves more than they want it for their kids.) I couldn’t leave California without getting a picture with her. What do I do with my collection? I don’t have one. During my initial college years of ball-catching failure, I read an article about the (presumed) record holder for most balls grabbed ever. He keeps all of them. I think he is a jerk. As a kid, it was my dream to get a ball. As an adult, getting a ball is a novelty—a story to relay to your friends, take pictures of, and write silly little posts about on baseball forums. After reading the article, I swore I would give the first ball I caught to a kid trying to live the dream. That moment had to wait for my junior year. The groundskeeper flipped the ball into my glove. I showed it to my girlfriend and found a mother with her five year old son sitting a few rows behind us. I asked if she would take a picture of us with the ball. She obliged. Although he was clueless, her poor son had no hope of getting a ball. So I thanked her for snapping the photo and tossed the ball over to her son. If that wasn’t the best day of his life so far, it has to rank pretty high. I have kept that tradition alive all the way to today. As I pack my car this weekend, there won’t be any baseballs in it. I have no batting practice ball collection. I haven’t kept a single ball. I will never be able to make my dream as a kid come true—it’s too late for that—but I can get close every time I toss a ball to someone who reminds me of me as a kid. Perhaps that will be my son one day. And if you thought my days of getting baseballs was over, think again. The Angels play the Rangers in Arlington on Thursday. I will be driving through Texas that day. Rangers fans won’t stand a chance. This entry was posted in Baseball, Game Theory and tagged Baseball, Game Theory. Bookmark the permalink. Although I’m not that interested in sports (as you acknowledge), I look forward to the day I can accompany you and my future grandson to an Angels game.